When Tom Prior and Fredrick Church settled in Venice in 1911, they hitched their rising star in the amusement park business to the success of Kinney's Venice of America amusement resort. 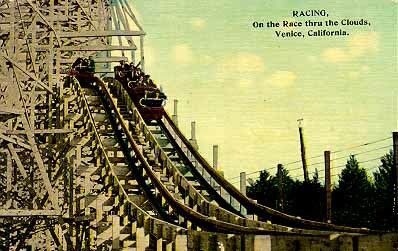 Prior was visiting relatives in the area when he noticed that Venice didn't have a racing roller coaster. It was a business opportunity that he found hard to pass up so he found some investors and made a deal with the Ingersoll Company in Pittsburgh to build one on Venice's lagoon, only blocks from the beach. He enlisted the help of his Chicago Riverview Park business partner, Fred Church to keep the ride operational. The two men had met in Chicago when Tom Prior was publicity director at White City and Riverview Park, Chicago's two great amusement parks. Fred Church, who was born in Ontario Canada, studied mechanical engineering at Tufts University and landed a job at Webster Manufacturing and Engineering near Chicago. The company designed and fabricated replacement parts for amusement park rides. Church was working on side-friction roller coaster car designs and began developing an interest in inventing new rides. Their new coaster, the "Race Thru the Clouds," was the largest side-friction roller coaster built by Ingersoll at the time. Its designer was John Miller, the reigning coaster designer of the day, and he traveled west by train to check on the ride's progress. The ride was 90 feet high and had 4000 feet of track for each of its two parallel tracks. When it opened on July 4, 1911 it was an instant success. With only half the cars on line, the coaster carried 25,230 people from 8:30 A.M. to 1:15 A.M. It got a fair number of repeat riders. The two partners formed a company called the Venice Amusement Company to operate rides and attractions in the Venice area. Their first new attraction was a miniature motordrome which they built on Windward across from the St Marks Hotel. 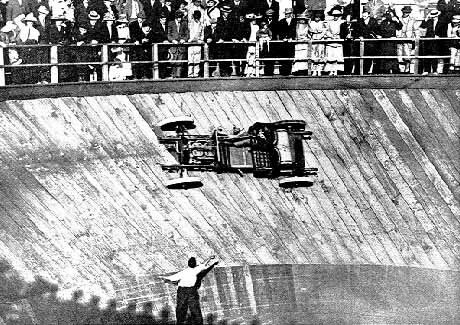 A daredevil driver raced his car along the 65 degree walls of the high banked saucer shaped track six times daily. The "Dare Devil Race for Life" was a dangerous exhibit and one driver paid with his life when his car, going much too fast, struck the wooden guard rail at the top, rolled over and crashed into the center in a heap. Then in 1917 they patented their "Racing Derby" Ride, essentially a racing carousel, which they debuted on the Ocean Park Pier in February. It was a 72 foot diameter machine where forty racing horses, were grouped four abreast in ten distinct races. The horses, which were set in six foot long tracks, would move back and forth as the ride rotated. sometimes moving ahead to gain the lead, other times suddenly falling back. When the ride reached a speed of 25 MPH, the bell would ring and the winners would receive free repeat rides. It was impossible to determine ahead of time which horse would win, because cables beneath the platform criss-crossed beneath the platform. After a dispute with the city of Santa Monica, the ride was sold and another, even larger, was built on the nearby Abbot Kinney Pier. When Tom Prior died in 1918, his son Frank took over the presidency. Their second roller coaster, the "Big Dipper", was placed on the Venice Pier in 1919. It was another Miller designed roller coaster which featured deep drops all the way to the ground and used innovative upstop wheels to lock it on the track while making several turning drops. They also opened a Mill Chutes ride next to it. It was a tunnel of love water ride which ended in a descent down a chute. In 1921 Fred Church patented a new type of roller coaster train with articulated couplings. They were two seater bob sled style cars, set on flanged wheels and coupled to the car ahead with a ball and socket joint. This allowed the cars to negotiate sharper turns. While Miller, with a similar patent, used them to design smaller kiddie coasters with a narrower footprint, Church used his cars to design an adult roller coaster. His experiment was on a new ride called the "Bobs" that was built beside his "Big Dipper" coaster in 1921 on the Venice Pier. Its lift hill and entire first drop were in a darkened tunnel and its turns were extremely tight. He sold several more of these style coasters to other California parks. In 1923 his new "Giant Dipper" roller coaster, another "Bobs" design, on the south side of the Pickering Amusement Pier in Ocean Park, took roller coaster design to new heights. Prior and Church called it "The Greatest Thrill Ride in the Country." The first drop dovetailed into a 180 degree fan-turnaround and drop. There were numerous banked turns (45 degrees) and camelbanks inside the three-tiered track structure. The action packed ride from start to finish was a sensation and attracted long lines of paying customers. Unfortunately the seven month old coaster burned in a catastrophic fire on January 6, 1924. However, it was rebuilt on the rebuilt Lick Pier and the 85 foot high coaster reopened on July 3, 1924. Similar style coasters were built on the Venice Pier in 1923, the Santa Monica Pier in 1924 and on the Redondo Beach Pier in 1925. 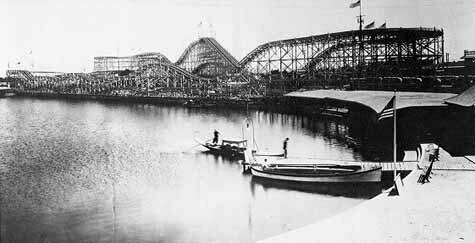 Traver Engineering built "Bobs" style coasters at Riverview Park in Chicago, Revere Beach and at Savin Rock. The partnership between Frank Prior and Fred Church ended in 1928. Their "Bobs" coaster was removed from the Venice Pier and Fred Church moved to the East Coast. He continued to design roller coasters at his office at Rye Playground. Two of his greatest masterpieces were the Traver built Long Beach California "Cyclone Racer" and the "Airplane Coaster" at Rye Playground. 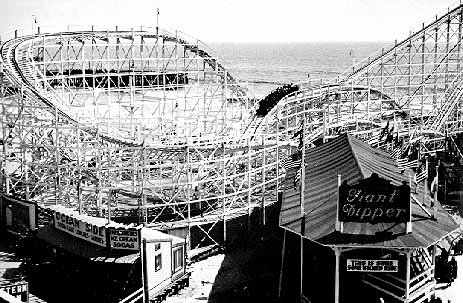 While nearly all of Fred Church's roller coasters have been destroyed, there are still two left in California; the "Giant Dipper" at Santa Cruz and the Mission Beach (San Diego) "Giant Dipper" (old name Earthquake). Both are National Historic Landmarks and aren't likely to be torn down.